One of the things I love most about my town is the fact that so many people here are awake and involved, working for change on all fronts - peace, sustainability, community, transportation. One glance at the "What's Happening" pages in our weekly newspaper shows the wealth of avenues we have here to become involved. From conferences on human rights to the annual Bicycling and Walking Summit to the "Clearcutting the Climate Conference, you literally have a whole handful of things to choose from in any given week to get involved in issues that really matter to our planet and community. This week I saw an article in a local running newsletter about the Eugene Marathon "going green". Employing everything from a solar-powered finish line to Master Recyclers, the marathon here is planning on being as environmentally sensitive as possible. As a runner and athlete myself, I think it's great that people are thinking not just of their own experience in the lovely outdoors, but of the environment that they're running through as well. One of the most common objections I hear to implementing more energy-efficient solutions in our everyday lives is that people don't like the way they look. Standing at a solar panel display at a home and garden show, you could hear people talking with one another about how solar hot water would be nice, but who wants such an ugly thing on their roof? 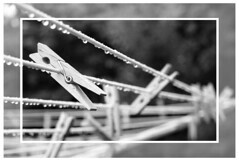 Neighborhoods in many parts of the USA have CC&Rs prohibiting hanging out one's laundry, and vegetable gardens in the front yard are equally forbidden. Right now, our country is caught in the last thralls of the Aesthetic of the Useless. This aesthetic can be seen everywhere from the starving fashion models on the cover of magazines (in countries where food is scarce, thinness is hardly to be valued - only in a culture of plenty can we exalt in emaciation) to the sterility of the bark mulched and shrubbed subdivision landscapes, devoid of any biological diversity let alone food-growing potential. I think a sea change is blowing in, but people will hold tightly to their last public displays of uselessness. Myself, I'm finding that the more I live around people who value utility, the more aesthetic I see in this kind of lifestyle. 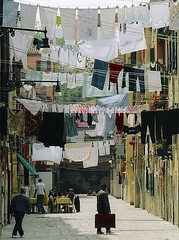 After all, how many fabulous photographs of clothes dryers do you see? Meanwhile, Flickr has entire groups dedicated to beautiful pictures of nothing more than drying laundry. 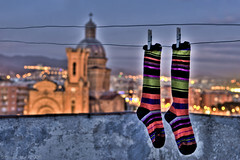 In the caption for this stunning image, the photographer tells us that "Nearly everyone in Barcelona, if not all of Spain, hangs their clothes to dry from balconies and roof tops." And homeowners Stan and Priti Cox in Salina, Kansas have transformed their suburban front lawn into an edible paradise, paving the way for other homeowners to embrace the aesthetic of the practical in this Edible Estates project. In returning to more sustainable lifestyles, we might shy away from making such bold moves, worrying about "what the neighbors will think". 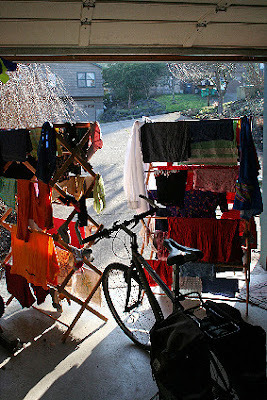 I've had people ask me whether my neighbors mind my chickens roaming the front yard, or my wintertime laundry solution of hanging clothes in the open doors of our south-facing garage. But often, it just takes a few "early adopters" to turn the tide in the other direction from where things are currently headed. So go ahead, hang that laundry, grow those tomatoes! Jim Kunstler (author of The Long Emergency) has got his 2008 predictions out there, and it's worth a read if only for his hysterically funny descriptions of what is really a very unfunny situation - the state of the world as we know it heading into this coming year. For those of us who have known this is coming for a very long time, there's no satisfaction in the "I told you so"s that will be ringing out as the oil prices rise and the ice caps melt. For every time I've been told my views are "extremist" or "hysterical environmentalist", I've always known in my heart that what I really was was a realist in a land of dreamers. Yet what can we do, but do the things that we can do to the best of our abilities, and hold onto love and happiness and all of the positive things that we can. Our family watched a movie last night, an old Disney flick called Miracle of the White Stallions, about the saving of the Lipizzaner horses during the last dark days of WWII. Any time I see or read something about WWII, the parallels always hit me. I wish I was better at remembering movie dialogue, there was one place in the movie where they were discussing the impending fall of the Reich, and how they had gotten to such a place where Hitler was allowed to dictate whether or not they could play music by Mendellsohn. The quote was something like "Don't be too hard on the people. It didn't come all at once. A little at a time, these things were eroded away, and everyone said "that's not so bad". I'm looking toward the caucuses on our East coast with hopefulness today, but the hope is that we can at least start turning around the eroding of freedoms and the warlike countenance that has pervaded my nation's identity in the last regime. For the rest - the peak oil and the ice caps and the rainforests and all of that, I'll be planting my gardens and crossing those fingers, hoping that the coming crises will bring out the best in people, not just the worst.